Should Magazine Street traffic run in both directions through the Lower Garden District? Among more than 100 people at a public forum Wednesday night, many strongly supported the change, some opposed it, and the rest felt the question has yet to be adequately studied. At Councilwoman Stacy Head’s request, the city’s Department of Public Works conducted an initial study of converting Magazine to two-way traffic from Calliope to St. Andrew. The project would involve changing traffic signals, signs and road striping — in addition to a six-month trial period — for a total cost of approximately $100,000. While Head said that she is still evaluating the project, the research and conversations she has had over the past five years appear to work in its favor, she said after the meeting. “Academically, it looks like it is a smart thing that makes sense,” Head said. 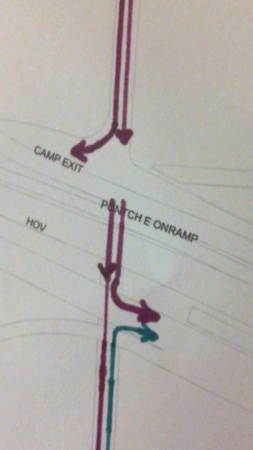 A diagram drawn by city officials shows how traffic would be handled under the Pontchartrain Expressway if Magazine becomes a two-way street in the Lower Garden District. Traffic heading Uptown from the Central Business District would be able to turn right (lakebound) or head straight through. Traffic heading downtown would only be allowed to turn right, toward Tchoupitoulas. A survey sent to addresses on Magazine and Camp and the cross streets in the area found about 60 percent approval for the project, a proportion that was repeated almost exactly at the meeting Wednesday night when organizers counted 40 audience members in support of the idea, and 27 opposed. Officials said they found Magazine Street respondents evenly split, with stronger support on the surrounding streets, and Head added that she felt overall support for the project is about 75 percent. 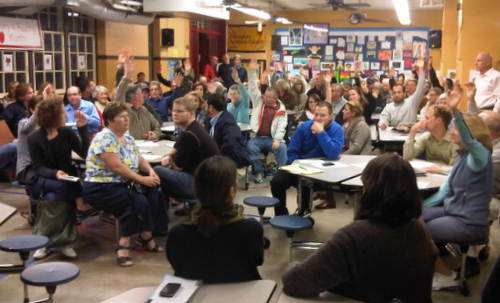 But quite a few audience members did not vote, and many pointed out specific aspects of the project — including specific intersections, school zones and crash studies — and that needed more thorough investigation first. Both sides of the debate claimed safety concerns as the rationale for their decision. Proponents said that two-way traffic generally flows more slowly than one-way, so it would lower speeds of passing motorists, in addition to eliminating crashes from drivers inadvertently heading the wrong way. Opponents countered that the move would increase traffic overall, crowding out pedestrians and bicyclists. Tied into the safety issue was economic development. Making the area easier for customers to reach will lead to new businesses and put more eyes on the street, reducing crime, supporters of the project said. Others, however, argued that derelict property owners are doing more to harm business growth than the one-way street, and said the move would promote businesses at the expense of neighborhoods. Dave Scott, a resident of the 1400 block of Magazine, said the $100,000 for the project would be better spent promoting business growth in other parts of the city that need it more, like New Orleans East. “In these economic times, how can you justify spending this amount of money on a street that’s not broke?” Scott asked. Officials will continue collecting survey responses until the end of February, after which the Department of Public Works will spend a few weeks compiling a formal recommendation to send to City Council. But work on the project would have to wait until the 2013 budget year, when money becomes available, Head said, and even so, no final decision has been made. To read our live coverage of the meeting, click in the box below. Why not let traffic on Magazine heading toward the CBD turn left to get on the Pontchartrain Expressway heading toward the lake? That would greatly REDUCE traffic congestion in other places. Traffic-calming devices? Of course, speed-trap cameras. What else?